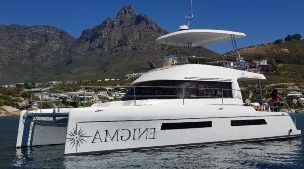 42ft Motor Catamaran Boat Charters Cape Town. 42ft MOTOR CATAMARAN BOAT CHARTER. 42ft Motor Catamaran: Brand new state of the art modern motor Catamaran. Great for: parties, functions, sunset cruises to Clifton or Table Bay, staff parties, Atlantic coastal scenic tours, braai (barbecue) cruises, bachelor/ette parties and birthday parties. 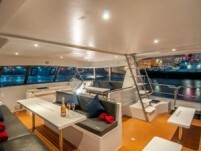 42ft Motor Catamaran Yacht Charter. Catering and bar facilities. Powered by 2 X 230 HP. R18 000 two hr. minimum at sunset.